Is Your Business Throwing Money Away With Your Food Waste? RMIT University is conducting a nation-wide research project called Watch My Waste to measure food waste in the hospitality sector in Australia. The research sees participating cafés and restaurants measuring their food waste over time with an easy to use app on their smart phone or tablet. 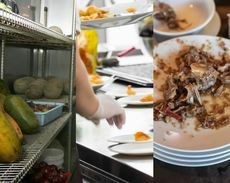 The research outcomes amongst other things will give a clearer picture on the volume of food waste generated by the food service industry in Australia and identify factors behind this with the aim of helping to target problem areas for businesses. This is a great opportunity for cafés and restaurants to measure their food waste and get a clearer picture on exactly what and how much is being wasted. This will hopefully enable them to make changes based on this knowledge that will save money and benefit the environment. Research starts in February 2015, and each business will participate for a three-month period. Businesses can sign up anytime until the end of March 2015.